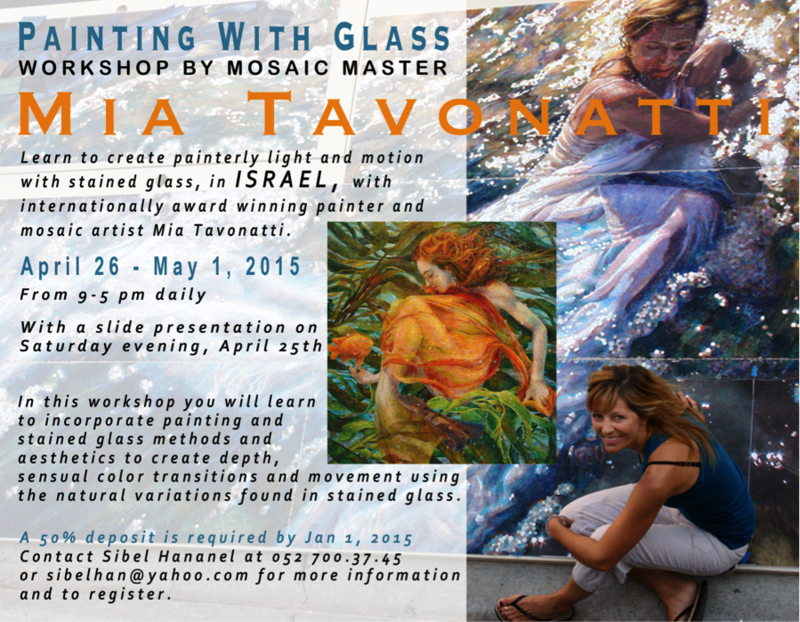 I’m very happy and excited to announce that the first international mosaic workshop of mosaic master Mia Tavonatti – “Painting With Glass” to be held in Israel! Subject: Mia will be teaching how to create painterly light and motion with stained glass. Location: Ariela Shimon Bechar’s studio in Modiin. Materials: Stained Glass (Tiffany Glass – Gil Raphael glass) and other needed materials are included in the workshop fee. Work Size: Around 25×25 cm …(The aim is to finish the mosaic work over the course of the workshop. Tools: Glass cutter and wheeled nippers (zagzag) will be brought by you. Please write your name on your tools to avoid any confusion. Minimum Experience: Must have experience working with stained glass, and know how to use glass cutters and nippers. Meals: Please bring your own. Maximum Presentation Evening: Mia Tavonatti will be giving a slide show talk about her mosaic art and paintings on Saturday evening of the 25th of April. For the participants of the workshop this event will be FREE. The information about the presentation place, fee and exact hour will be informed in March 2015. Payment: 50% of the workshop fee must be paid by the end of December 2014.The balance is due by Feb 1st. *Mia will also be awarding each person who attends her workshop with a hand signed Certificate of Completion, to commemorate the occasion. The first 12 people who make the down payment will be registered for the workshop. Contact Sibel Hananel or Mia Tavonatti for any further information.